In stock analysis, the tendency for a stock ticker price to rise, to have the chart going from the lower left to the upper right, is called “Alpha”. So you have sites with names like Seeking Alpha that are doing stock watching. So just what interesting tools are there to ‘find Alpha’? 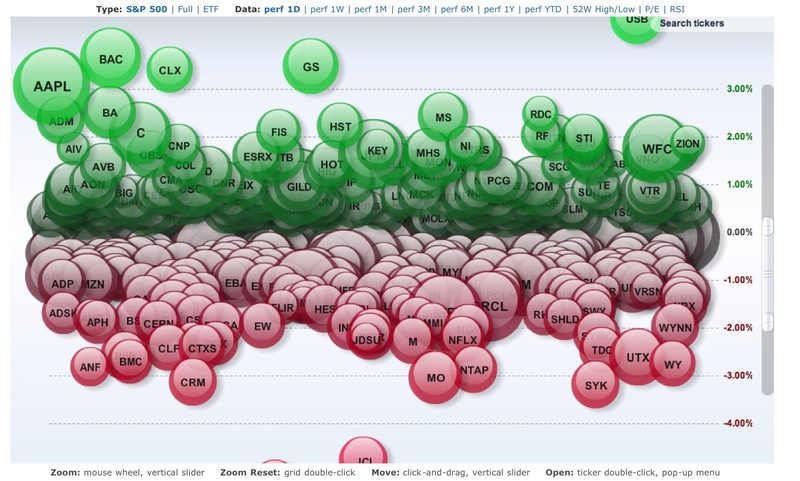 Another interesting one presents stocks as “bubbles” (the slider at the right on their site lets you get ‘separation’ between the bubbles to read them better). So in theory you want the bubbles that are rising and not the ones that are falling. In the view ‘today’, the financials are shown rising, in keeping with what looks like a short covering rally in those long suffering names on a proposed Debt Deal in the USA. (I’ve not figured out a way to do a ‘capture’ of the live version for inclusion). Compare with the 3 Month Performance Live Bubbles Chart here. In that way you can see how the 3 Month Alpha is different from the action ‘today’. The 3 month chart has tickers like NFLX, M, TIF, COG, BIIB, COH, AMZN, MA, AAPL. On the bottom in deep red are the financials like GS, BAC, etc. So as a quick speculation, we could guess that the “financials” that have had high negative Alpha for a long while may well have had a bottoming ‘short cover’ and could then go verify that with closer inspection of the stock charts. It would likely also be a good time to look at those long term High Alpha stocks and see if a ‘sea change’ is underway with the major Hedge Fund players et.al. shifting strategies (and driving future stock movements as they do so…). Basically, is there an ongoing High Alpha Trend to continue to ride, or are we having one of the modestly rare, but periodic, inflection points of strategy? At Barcharts, they also have a list of the “top 100” stock tickers. How does their top 100 list compare to the “bubbles”? On this list we see some others that we’ve identified from other methods: WNR and BAS in the oil patch. Some silver miners along with the AGQ leveraged silver ETF. LULU Lululemon in specialty athletic goods. MCP Molycorp in “Rare Earth” mining. JVA and GMCR in the coffee space. DDS Dillars in retail. So there is some inherent confidence in the list as we’ve got partial confirmation by independent means. Yet there are some “stinkers” in the list. It is not ‘quality filtered’ very well. USATZ is a “penny stock” with a price of $1.23 and with no ‘profile’ or financial data at Finance.yahoo.com. So you have some “QA” to do before you can just toss money at a ticker off of that list. It lists some we could clearly state are ‘already known’ as an avoid, such as “ZSL Ultrashort Silver” and “FRO Frontline” in the shipping business (where I’ve speculated a bottom may be “soon”, but has been falling steadily to date). On that page we can also see evidence of a ‘short cover’ in the banks, with BFSB Brooklyn Federal Bank up 2.86% today and AIG-A American International Group Preferred A shares up 2.61%. (Some other banks on the list are showing down days, so are still stinkers). So, a nice place to pick up “Alpha” ideas, with the only real “problem” being that the “time scale” is ill defined and there is little you can do with their site to pick out ‘changes’ from a long term dog to a new bottom or a long term buy to a ‘topped out’ until some long time after the fact as it slowly leaves the Alpha list. OK, we can ‘fix that’ with our “race charts”. So take the “Alpha Ideas” and “race them” to find the ones with High Alpha and more room to run to the topside. So I’ve used BarChart from time to time to get ‘ideas’. Generally a useful tool, but with a slightly long ‘time window’ and a bit slow to change direction at market tops / bottoms. So for that, you need to set your context with the charts from the WSW postings… and know that when the tide turns, you need to turn away from BarCharts until it has had time to ‘catch up’ with the new direction. Hopefully this gives you some ideas you can use to find “hot stocks” and “hot sectors” in your own search for More Alpha in your portfolio. Just remember to seek out some alpha, but QA screen the rides for the long term good ones, and watch out for market inflection points with decent market charts; then, and only then, hop on the ride: but use a nice chart of the SMA stack and the inflection identification tools (‘failure to advance’, RSI 80, MACD inflection, etc.) to avoid buying into an old stale Alpha Dog just before it heads south..
Yeah, it’s a bit more complicated than a simple ‘trend follow of an index’; but you have more potential for big gains that come with that added work. Thanks once again for helping educate us.